Barbados in the Lesser Antilles consistently features as one of the most popular holiday destinations in the Caribbean. With a variety of resorts and luxurious beachfront villas in barbados overlooking the sea, tourists can have their own slice of paradise. But rather than spending all your time sitting around the pool, why not check out some of these other impressive attractions on the island-nation? Crane Beach is a favourite beach in Barbados for locals, tourists, and cruisers. Once acting as a harbour to unload cargo travelling into and out of the country before transforming into a tropical beach today. Apart from the pink coral sand fringed by palm trees, diving enthusiasts can explore nearby shipwrecks. Most visitors spend at least three to four hours on this iconic beach. The Marine Park offers an unparalleled diving experience in Barbados. Expect to find vast networks of colourful corals, thousands of fish and shipwrecks. Only experienced divers can explore the sunken treasures as part of a guided excursion. But don’t let this put you off. Simply donning the snorkelling mask will open a window into the abundance of life beneath the waves. 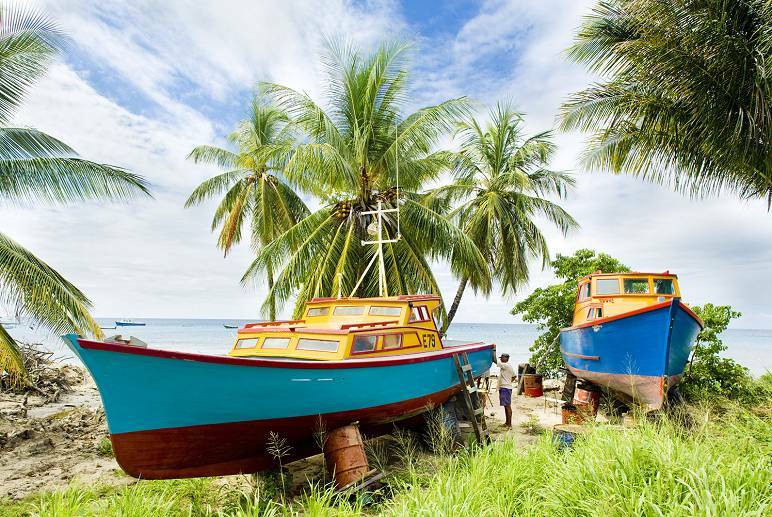 For those who want more flexibility, head to Holetown and charter your own boat. The Victorian-style Sunbury Plantation is a prime example of British colonial architecture in Barbados. The intricate decorations and antiques combine with the sprawling gardens featuring some of the island’s oldest mahogany trees. Visiting the estate will give a glimpse into the former way of living. It’s strongly recommended to get a guide to explain the context and provide nuggets of information to help you appreciate more about this piece of their history. The idyllic village acts a haven for beach-lovers and photographers. As the Bathsheba beach stretches along the coastline, laid-back locals chill out in the small shops and bars. This is a top spot in Barbados to take photographs of the island paradise and meet some of the locals. But plan your trip carefully as it’s also a favourite with cruise ship passengers and gets crowded at certain times of the day. If you have your own vehicle, why not head to nearby Andromeda Tropical Botanic Gardens and Flower Forests too? Located a short drive from Bathsheba, the Flower Forest rarely gets the attention it deserves. Tropical flora and light forest cover the 53 acres of land. Follow the network of trails and pass through the park keeping your eyes out for wildlife and flowers including their famous collection of orchids. But the highlight is climbing the top of the hill which offers panoramic views of Barbados. Most people spend around three hours at the Flower Forest and combining this with a trip to Bathsheba Beach is a must. If you want to see some of the wildlife, head to Barbados Wildlife Reserve. The relatively small centre opposite Farley Hill houses various mammals, lizards and birds. Keep your eyes open for the iguanas, tortoises and deer as well as the tropical birds perched in the trees. Follow the trails and you’ll pass several colourful orchids too. This is a great way to spend the afternoon with young children or to capture the exotic creatures on film. Barbados doesn’t usually advertise the fact that they have networks of caves penetrating the interior’s limestone cliffs. And joining a tour to get inside the subterranean world offers a unique experience. Harrison’s Cave features a limestone tunnel passing through the cliffs to streams, pools and waterfalls. Mystical stalactites and stalagmites bathed in light create an otherworldly appearance. Before you move through the caves, instructors will teach you about the geology and science of the systems. Signal stations were a common theme in colonial Barbados. The centres located high on the hills proved to be the perfect place for communication towers. But the bonus of their height is the views. The best time to climb Gun Hill is early in the morning to witness the sunrise. You can expect crowds of other tourists during the sunset. Remember to pack your camera and anticipate spending at least an hour at the top. Other colonial relics at Gun Hill include the 19th-century sculpture of a lion. It’s no secret that the island-nations in the Caribbean love their rum. According to Barbadians, the best place to buy locally produced rum is at the Mount Gay Distillery. If you take a trip, you can join a guided tour of the complex. This will help you appreciate the history, craft and heritage of the region’s favourite drink. And it gives you the chance to buy a few bottles to bring home as souvenirs too. Anthony Hunte opened Hunte’s Garden during the colonial days. Stretching for dozens of acres near St Joseph’s Parish, you’ll find a collection of endemic plants and flowers. Highlights include papyrus, orchids and crotons with plenty of benches to rest your feet and admire the views. Barbados is an island paradise with beaches, caves and protected forests. If you’re on vacation, get out there and make the most of what the island has to offer. You’ll create more memories and snap better photos than staying on the beach or sunbathing near the pool!